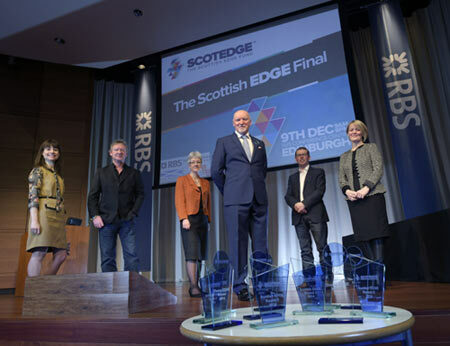 Scottish start-ups were given a huge financial boost last night, when the ScotEdge fund awarded over one million pounds in loans and grants to exceptional start-up businesses. The awards were given to the new Scottish businesses which were best able to demonstrate their ability to grow and bring valuable turnover and jobs into the Scottish economy. Judges L-R: Evelyn McDonald, ScotEdge, Bill Morrow, Angel’s Den, Eleanor Mitchell, Scottish Enterprise, Sir Tom Hunter, The Hunter Foundation, Kevin Dorren, Diet Chef and Alison Rose, Royal Bank of Scotland. The event, which took place at RBS Gogarburn HQ in Edinburgh, saw a panel of some of Scotland’s leading business people award up to £100k per business to winners. The winning businesses pitched for three minutes to the panel of judges in front of a live audience of 300 people and then faced a Q&A of nine minutes. Sir Tom Hunter, The Hunter Foundation; Alison Rose, Royal Bank of Scotland; Bill Morrow, Angel’s Den; Kevin Dorren, Diet Chef and Eleanor Mitchell, Scottish Enterprise all deliberated hard to reach a decision on the most worthy winners. The scoring criteria for applications covered Business Growth Potential, Entrepreneurial Spirit, Innovation, Ambition, Internationalisation and Risk / Cost Awareness. The final follows on from a number of regional heats which took place across Scotland. TV presenter and founder of Diary Doll which previously won a ScotEdge award, Carol Smillie acted as host for the day. These awards follow on from a successful four previous rounds, which saw 69 Scottish businesses awarded funds. To the end of September 2014 this investment has generated 207 jobs, £8.4m turnover and £4.25m investment. “Since the launch of Scotland CAN DO, we have created a platform to allow our ambitious entrepreneurs to excel. This has been driven-forward by the collective impact of public, private and third sector partners. The awards were supported by a number of partners and ambassadors including Harper Macleod, Johnston Carmichael, Amazon Web Services (AWS) and Samsung who were on hand to offer free support to Scotland’s up and coming entrepreneurs.